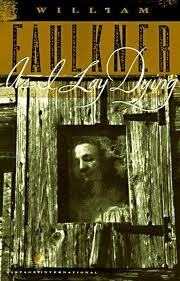 Reading “As I Lay Dying” in high school was my introduction to full-length Faulkner. I see this as both a blessing and a curse. A blessing because starting with, say, “The Sound and the Fury” might’ve caused me to break out in hives and consider myself allergic to his work. (This had happened before with Melville/”Billy Budd.”) A curse because “As I Lay Dying” set the standard by which I judge Southern novels. So far, everything else has come up short. In “As I Lay Dying,” Faulkner offers a collection of first person narratives, recounting the adventures of a family transporting a dead body across Mississippi in the middle of summer. Why would they attempt this, you might ask. Because the body belongs to their mother (who had previously lain dying), and she insisted on being buried with her people. Also, each family member has an ulterior motive for going to town, ranging from Vardaman, the youngest who wants a toy train to Anse, the father who wants a new set of teeth (and manages to snag himself a new wife in the bargain). I once made the mistake of taking a graduate-level course on Faulkner, which required reading an assigned novel every couple of weeks. I’ve always had a penchant (and dare I say, talent) for getting things done at the last possible minute. Not so with Faulkner. His work should be savored like a piece of artisan-crafted dark chocolate, not gobbled like a waxy Hershey’s Kiss. Sure, I read “The Unvanquished” in one night, but I can’t recall a single plot point. I’d guess it’s about a dysfunctional Mississippi family who may or may not turn out to be vanquished. Am I close? The most common complaint I hear about Faulkner is that his work is difficult to read. No argument there: it is. But it’s kind of like exercise: difficult at the time, but satisfying (especially if you reward yourself with ice cream once you’re done). 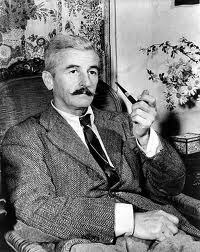 What’s your favorite Faulkner novel, story, or anecdote? And if he’s not your cup of sweet tea, who is? Photo credits: Rowan Oak sign and Faulkner’s writing on the walls photos courtesy of Nick Russell. Check out a collection of his AH-MAY-ZING photos on his blog Visual Textuality. Here is one regret I’m almost too ashamed to tell y’all about. No, it’s not the time I knocked over an elderly lady’s mailbox because I was driving like a “bat out of torment.” And it’s not the time I destroyed my sister’s sausage biscuit in a near-murderous rage. No, friends, this is far, far worse: I grew up less than 20 miles from a living literary legend, and I never once met her. 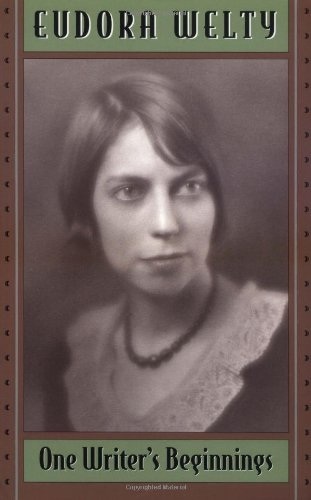 But, actually, what shames me isn’t that I never met Eudora Welty; it’s that I didn’t even TRY. I’ve been telling stories since before I could write my name. When I was three or four, I’d sit in front of a tape recorder spinning yarns or perhaps recounting my memoirs. Sadly, these tapes have long since been lost (and don’t you just KNOW they’re Pulitzer Prize material?). One time when I was home, my dad told me he’d come across a cassette taped labeled “Kim Holloway: Keep Forever.” Of course, when he went to get it for me, it was nowhere to be found. I reckon it will turn up one of these days, and I’ll find out it’s a Duran Duran mix tape or somesuch. Well, now. Here I am. Sorry, 16-year-old Kim (or “Fiona” as you were calling yourself back then). Back in the day, what I knew about Ms. Welty would fit on an index card: She was a famous writer who lived in Belhaven. She shopped at Jitney 14 (a grocery store for y’all not familiar with the now-extinct “Jitney Jungle” chain). She had a library named after her. As much time as I spent in that library, you’d think I’d have run into her at least once. Alas, you would be wrong. I was far too busy chasing long-haired boys to worry with a white-haired lady. It’s not that I hadn’t read Ms. Welty. “The Worn Path” was assigned reading for my high school lit class, but I wasn’t altogether moved by a grandmother’s journey to get medicine for her ailing grandson. Yawn. 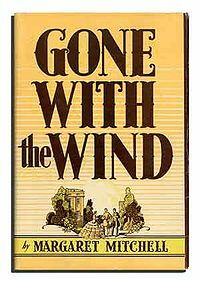 Since this is my blog, I’ll allow myself to interject my theory that high school lit classes do students a disservice by assigning classics that they’re not prepared to: A. understand or B. care about. I’m not suggesting adding “Twilight” to the curriculum, but if you’re planning to assign Steinbeck, perhaps opt for “Of Mice and Men” instead of “The Pearl.” And could you please stop introducing Hemingway as the person who wrote “The Old Man and the Sea.” At the risk of sounding age-ist, I think teachers should refrain from assigning material featuring elderly protagonists. Immortal protagonists are ok.
Oh, how my life might have turned out differently if “Why I Live at the P.O.” had been my first exposure to Ms. Welty’s genius. If you’ve never read EW, this is the place to start or listen to an excerpt here (caveat: If you’re not fluent in Southern dialect, you might want to read along). Last year, I read a biography of Eudora Welty that probably ought not to have been written, seeing as how Ms. Welty guarded her privacy. Perhaps she’d consider me churlish for even reading it (I learned the word “churlish” from EW and love having occasion to use it). Imagine my surprise upon discovering that the EW I grew up knowing – the reclusive, genteel spinster – had once been a globe-trotting socialite. Ok, “socialite” might be overstepping…But, still, Ms. Welty spent months at a time in Europe, San Francisco and New York. Though almost all of her stories are set in the South, many were written when she was far enough from home to gain perspective. So, yes, here we are. I would never be so bold as to compare my writing to Ms. Welty’s witty prose, but I think that one of the traits we share – apart from being genteel Southern ladies – is that we both had to leave home in order to find it. 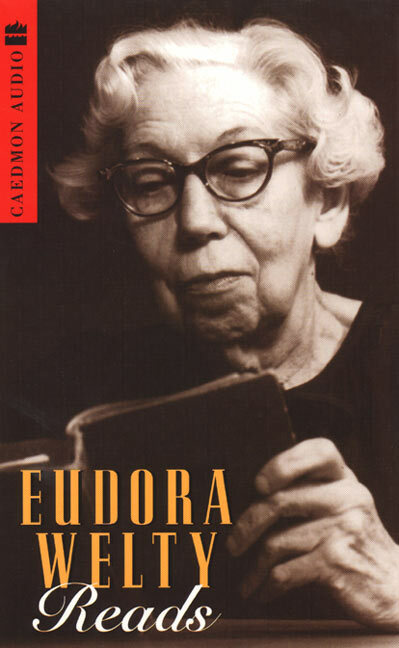 What’s your favorite Eudora Welty story?